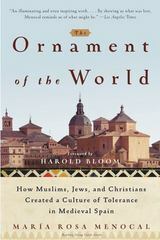 The Ornament of the World 0 Edition Widely hailed as a revelation of a "lost" golden age, this history brings to vivid life the rich and thriving culture of medieval Spain where, for more than seven centuries, Muslims, Jews, and Christians lived together in an atmosphere of tolerance, and literature, science, and the arts flourished. of photos. 3 maps.